You know the feeling, that little tingle in your nose or throat, followed by a few sneezes and the feeling that you could take a nap just about anywhere. You are coming down with a cold. Now what do you do to halt its progress and prevent future infections? Of course NOT catching a cold is the best option and the ultimate in prevention is to simply not come in contact with a cold or flu virus. Chances are you will though. You can improve your odds if you frequently wash your hands, don’t touch your eyes, nose, or mouth and try not to hang out with sick people. This of course is easier said than done. Rhinoviruses account for a majority of cold virus infections in the fall, and of those exposed 70-80% will go on to develop symptoms. The goal once infected is to be in the 20-30% that don’t develop symptoms or if you do have symptoms, reduce their duration and severity. One very cost-effective way to reduce the symptoms of a cold is to have a good attitude and a positive outlook on life. A study published in 2003 in Psychosomatic Medicine found those with positive attitudes had fewer cold symptoms than those with depressed or angry attitudes. Outlook on life did not have an effect on who caught a cold. Happy people became infected at the same rate as those with negative attitudes; they just didn’t feel as bad! Cold viruses appear to take advantage of a weakened immune system. Factors that can weaken the immune system include excess alcohol and sugar consumption, stress, and lack of sleep. A healthy diet, moderate exercise, adequate sleep, and stress control form the foundation for an immune system that will be ready to fend off respiratory viruses. Adequate, but not excessive, intakes of vitamins A, C, E, D and B6, zinc, and iron appear to be especially important in maintaining immunity. Most people, and especially those with type 2 diabetes, benefit from a daily multivitamin and mineral supplement. It can help meet the basic nutritional needs of those who are stressed or who don’t eat a healthy balanced diet. Make sure your multi includes selenium. According to Dr. Melinda Beck, Ph.D., professor of pediatrics and nutrition at the University of North Carolina at Chapel Hill, a diet lacking adequate amounts of selenium could lead to mutations in the flu virus making it more dangerous. Food sources include Brazil nuts, tuna, chicken, sunflower seeds, garlic and wheat. 55 micrograms per day is the current RDA for adults. 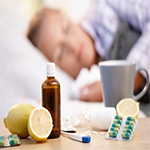 Taking zinc at the very first sign of a cold may help. Studies have found adults taking zinc lozenges containing 9-24 mg elemental zinc gluconate or acetate every 2 hours at the first sign of a cold can significantly decrease the length and severity of the cold. Do not take zinc lozenges for preventing a cold long term as too much zinc can lead to a copper deficiency. Vitamin D is quickly becoming the new vitamin C for its role in maintaining a healthy immune system. Vitamin D produces “cathelicidin” and “defensins” which are proteins with anti-viral effects. It also has anti-inflammatory properties. A 2009 study published in the Archives of Internal Medicine found those with the lowest levels of vitamin D were 36% more likely to have had a respiratory illness than those with the highest levels of vitamin D. Those with asthma or COPD were at an even greater risk. A study published in May 2010 in the American Journal of Clinical Nutrition found that school children receiving 1200 IU of vitamin D a day had a reduced risk of influenza type A compared to those receiving a placebo. Some studies have not found a protective effect with vitamin D however. The American Academy of Pediatrics recommends all children receive 400 IU/day of vitamin D3 starting in the first few days of life. This is double previous recommendations. Some health experts recommend even higher doses during the winter months. Children under one may take up to 1000 IU/day and children over one may take up to 2000 IU/day, especially during the winter months with low sun exposure. The upper limit is set at 4000 IU/day for adults but your healthcare provider may recommend higher amounts based on individual risk or based on vitamin D testing with a 25(OH) D test. Very high doses of supplemental vitamin D can be toxic. Consume probiotic-rich foods regularly such as yogurt and kefir. Probiotics help maintain balance in the GI tract by warding off unwanted bacteria and yeast, and recent studies suggest that probiotics can help reduce the length and severity of cold symptoms. Echinacea is a popular herb that appears to help boost activity of immune cells responsible for fighting all kinds of infections. The use of echinacea for longer than six to eight weeks is not recommended however, as it appears to lose effectiveness. Therefore, you shouldn’t take echinacea throughout the entire cold and flu season. Take it only if you have been exposed or feel symptoms coming on. Additionally, the effectiveness of echinacea in studies has been mixed, but the best evidence appears to be when the Echinacea purpurea species is used. The elderberry, which is a dark purple to black colored berry, seems to hold great potential for those unlucky enough to come down with the flu. Some studies have found that elderberry extract can help reduce the severity of symptoms and duration of the flu by more than 50%. It contains a variety of plant phytochemicals that possess anti-inflammatory and immune stimulating properties. It also appears to help block the virus from replicating and entering cells.